. 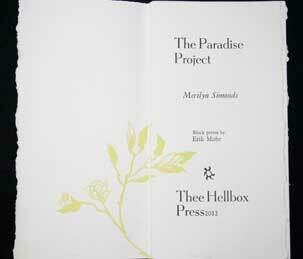 The Paradise Project | Excerpt . He loved everything about the plant: its vigorous growth, its prolific bloom, and especially the dark purple fruits that glistened like sweet jellies among the leaves, though they were bitter, un-palatable even to the birds. He found it growing on a hard piece of earth behind an outbuilding of the first place where he lived, a down-stairs apartment with access to a small yard that he was encouraged to improve. He dug up the plant, a spindy thing, and moved it into the sun, top-dressed it with sheep manure. It thrived. After two years, he left. The pattern of his working life was set early, for he was a diplomat of minor account. He didn't mind. He got quite used to moving on, finding small houses to rent, rarely apartments, for somehow he needed to step out his door onto earth, into green, if only of the most elementary sort. He found ways to make himself feel at home, setting out his favourite bowls and the ebony brush and comb his mother had given him, the wall hanging he bought in Nairobi, the small mat a secretary had given him as a parting gift. He arranged the food in his refrigerator, the socks and underwear in his drawers in the same way in each place so that if he were a blind man, he would hardly know that he had moved. He always took a small cutting of the purple-fruited plant. The transport of vegetative matter across national borders was frowned upon, he knew, but tourists carried more potent seeds wedged in the soles of their shoes, of that he was quite certain. Besides, he assured himself, it was only one plant. No matter where he heeled it in, the cutting prospered: in the lush loam of Sri Lanka, the red lime dust of Cuba, the dark volcanic scrapings of Iceland. It rarely bloomed the first year, though it would put on growth rapidly, sending up stalks in profusion that transformed his back garden, wherever it was, into a familiar grotto. In the second season, the lovely purple fruit would set and he'd spend his evenings bathed in the indigo light glinting off its strange translucent skin. He was a man who never looked back. Country to country he travelled, leaving his small, considered mark on the diplomatic culture of each place, eventually retiring to a small house in the nation of his choice, where he died soon after of a pulmonary complaint to the regret of very few, for although he was a kind and compassionate man, he made a habit of cutting ties with acquaintances whenever he moved. His meagre effects he left to a nephew who hired a moving company to deliver them to a charitable cause. His only legacy was a wild, insistent vine that bloomed in a dozen countries, seducing others to uncharacteristic acts of horticulture, until no corner of the planet was free of its soaring stalks, its lurid purple fruit.